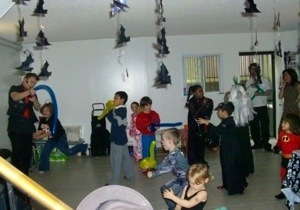 We did have a Halloween/birthday party one year… It was the best (see photo above). The Amazing Max Darwin performed an awesome magic show (highly recommend–the adults loved as much as the kids), we also had Halloween games and activities, food and cupcakes for the birthday boy. But I would imagine it’s a little like having your birthday on Christmas–you’re kind of upstaged, because there’s always something else going on. There certainly have been exceptions–his 40th was one, for example–and he’s wonderful about it. One occasion my husband and I did dress up together, we went to a grown-up party– I was a cop, he was my prisoner (that’s us in the photo above…and yes, his tattoo is part of the costume and totally fake ). It was simple but fun and we played with the appropriateness, for sure… luckily no one took full-body pictures of me. But since then, we’ve never really had a reason to dress up in a major way–and with kids, it’s really been their holiday anyway. 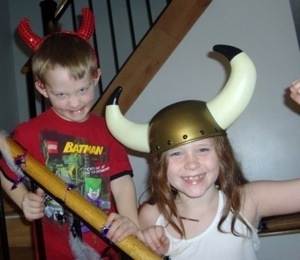 But now the kids are getting older, hanging with their friends and doing their own thing (and frankly, they don’t want us there) so we really could do something for Halloween other than wait for trick-or-treaters and hand out candy. The question is, would we ever dress up again? And if we did… It would have to be KILLER, right?!?! So these are my findings in the search for a killer idea that can translate into a costume for two…bear in mind, my husband has agreed to none of this. – The Muppets! – The combos are endless: Bert & Ernie, Kermit & Piggy, Stratford & Waldorf, Gonzo & Camilla (she’s a chicken)… You can even put your unique spin on it, for example, we had friends who were Ernie & Bert one year, but they were bikers–and it was brilliant!! – Chapman and Mendez from Orange is the New Black–we could just swap costume parts– kinda, sorta–from a few years ago. Or we could just wait for the kids to come home, order in a pizza and then dig into the leftover candy bowl… it’s a hard choice.